Part of the charm of a wonderful Bed and Breakfast like Cortijo La Haza, is the personal touch. It is apparent in many things, the way people are welcomed, the quality and preparation of food, particularly making sure it suits all tastes and works within dietary constraints, for example. But also, very importantly, the way guests are being informed and helped with guidance towards visiting the area. Apart from the odd guest who wants to discover it all on his own, all of you who have stayed before know the particular care Bernadette takes when it comes to making sure your visits and days out are well-organised. With that in mind, the reading room at La Haza has been turned into a mini library with guide books, leaflets, maps, too many and too varied to mention. The attention to details starts with the organisation of this information. While the Junta de Andalucía offers many folders and leaflets, these need to be obtained. So, before the season really takes off, a trip has to be made to the Coast, to go and pick up the bulk of the leaflets. But there are many for which the Junta has no information, so these then needs to be procured locally, which makes for many trips around the area. 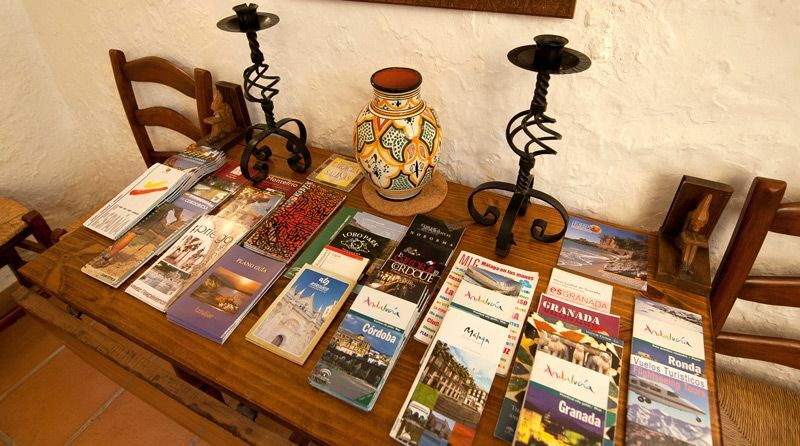 Any trip our guests make, be it locally to the white village of Iznájar (the home of our beautiful B&B), boating on the lake, or further afield to larger places like Granada, Córdoba or even Seville, Bernadette has already been there and made sure she has the right information for you to take. Just a tiny portion of the vast information on the area. With that in mind, there are printed route cards for most destinations around the area. The location of Cortijo La Haza is, after all, in a slightly more remote part of Spain, and GPS systems do not always give the right information. So we have the simplified routes on hand for your convenience (in various languages). Needless to say, it doesn’t stop there; the information is as complete as you wish/need. Places to park, often free of charge, where to go, what to visit, quirky things you might never come across, handy tips and tricks, and, of course, places for a tapa and a drink, or a light lunch. But that would be forgetting the weather, where necessary your itineraries will be worked out with the best meteorological conditions in mind. All of it has been tried and tested, which means only places that meet with Bernadette’s approval will feature in your plans, allowing for consistency of service and quality. Where necessary, help will be provided with booking tickets, in the event you hadn’t done so already. During the booking process you will already have found out which places sell out quickly and where you need to book before taking off, as it will be in your booking confirmation. Unable to get tickets? Forgot to book? Never mind, time will be spent with you to see if any last minute reservations can be made, even for the Alhambra or the Caminito del Rey (but it’s always better to make sure you book in good time to avoid disappointment). While it is no guarantee of success, many guests have been able to go and visit these places after all with our help. So, if you want to give your holiday the success it deserves, first of all, make sure you book here , in our amazing Bed and Breakfast, and, above all, use the service that is provided for your visits. It will enable you to fully enjoy your days and ensure you have made the most of your holiday. Always knowing that Bernadette will do all she can to help. Moreover, and contrary to many other places, it is completely free. No commission or other charges will apply. All part of the service! Your rural holiday destination with a central location between Granada, Málaga, Córdoba.